Crystalline Entity – We are Crystalline Entity from Colorado State University, the first BIOMOD team in Colorado. Our goal is to design tile-based DNA-protein co-crystals that serve as a host crystal for guest structure determination. LOOK AT OUR DESIGNED CRYSTALS! Watch the video below for an overview, then scroll down to learn more in depth! If you would like to see the script for this video, click here. Lysozyme crystals grown by high school interns during summer of 2018 (see Outreach page for more information). Why are scientists interested in the structure of biomolecules? For proteins, the structure helps determine the function. For example, the most studied protein crystal is that of Lysozyme [PDB code: 1DPX ], an enzyme that breaks down bacteria in human tears (Weiss et al 2000). The function was confirmed by seeing the structural backbone of the protein via X-ray diffraction. X-ray crystallography is generally used to help determine the atomic arrangement of a biomolecule in a crystal structure. An X-ray beam shoots through the patterned crystal and the diffraction pattern reveals atomic-level details. Because the molecule is repeated throughout the crystal, we can get diffraction patterns from all angles of the crystal and compile them into a structure model. Traditional methods for X-ray crystallography can be haphazard, expensive, and time-consuming. Producing diffraction-quality crystals that are large enough and of substantial purity can be difficult. Some scientists have even described success in the crystal growing process as “dumb luck” (Cudney 1999). Furthermore, operating an X-ray source (international synchrotron radiation facilities) and positioning the crystal in the path of the X-rays using a micro-scale loop and cryo-protectant methods is challenging in itself. For example, the Protein Structure Initiative, a research proposal funded by the U.S. government from 2000 to 2015, was successful in determining the structures of many macromolecules, but had an overall success rate of about 7,000 out of 58,000 target protein structures (PSI Metrics 2017). The single largest obstacle to the program’s efforts was growing suitable crystals. In the field of DNA nanotechnology, high-resolution DNA crystals are a desired commodity. Some of the most precisely designed crystals composed of DNA tiles are the Seeman lab Tensegrity Triangle crystals reported in 2009 (Zheng et al. 2009). These crystals diffracted to about four Angstroms. A hypothetical model of a DNA scaffold proposed by Nadrian Seeman in 1982 (Douglas 2017). Current efforts focus on crystallizing more precise DNA tile or origami crystalline structures for even higher resolution. One application for these designed crystals is guest capture (Seeman 1982). Joining a patterned crystal, the guest structure can be observed in atomic detail via X-ray diffraction. This host-guest paradigm could supplement or replace current molecule structure determination methods. Our project tests a different route to achieve high-resolution crystals from DNA tiles. Pure DNA crystals are very flexible, and flexibility increases with more porous crystals. Our team is engineering crystals composed of both DNA and protein, formally known as co-crystals. Using this protein-DNA hybrid, we hypothesize co-crystals will possess greater structural integrity than pure DNA crystals. The DNA will offer a backbone for the crystal while the added proteins will insulate the structure and provide more rigidity. Co-crystal of Ets-1 protein (dimer) and a design DNA strand. The co-crystal structures we chose to design are from existing structures of protein and DNA. Specifically, the Ets-1 transcription factor binds to a double stranded DNA strand (with 23 base pairs). To our design advantage, the DNA in this co-crystal arranges like pillars. In our designed co-crystals, we do not change the protein-protein contacts. Instead, we focus on designing the DNA. Our design proposal is to fuse together four DNA blocks found in the crystals. This four-block fusion is called a DNA tile (read more about DNA tiles on the computational page). These designed tiles may improve the self-assembly of the co-crystals. To match the geometry of the intended crystal assembly, the DNA tiles consist of two parallel double helices connected by modified DNA phosphate linkers. 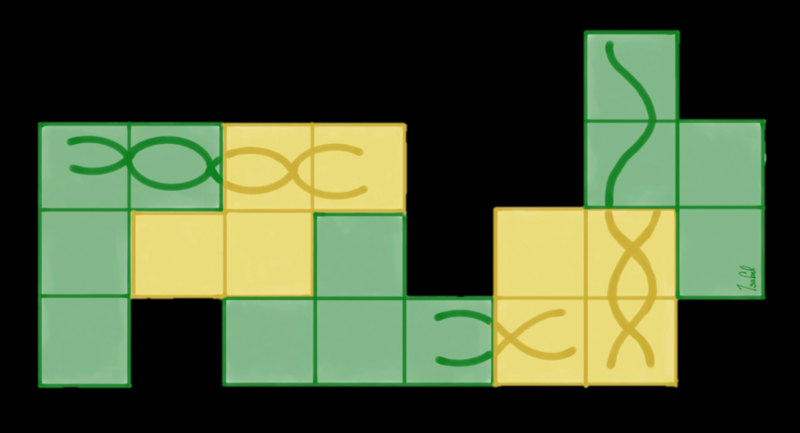 The DNA tiles also possess sticky ends, allowing for favorable tile-tile interactions. In January 2018, our team brainstormed the project. We chose to pursue DNA tiles in co-crystals, as the project has major implications in the field of structural biology and each step, from initial design stages to making the co-crystal, takes a reasonable amount of time. There were dozens of potential DNA tile designs, all crafted by members of the team. We developed an approach for the experiment: draw out several designs, figure out which one(s) would work best, and then try to produce co-crystals. Our project was manageable over just a few months by dividing the team into two sub-teams: the computational team and the experimental team. To design the DNA tile while preserving the ability to bind scaffold proteins, the computational team used the NUPACK software suite, wrapped with PYTHON scripts. In addition to proposing specific DNA strand sequences, the scripts also assessed the likely assembly yield and annealing temperatures for various input tile designs. After the computational team narrowed down the possible DNA tile designs, the experimental team obtained DNA strands corresponding to the first feasible design and annealed these strands to form a tile. The annealed tiles were incubated with protein before crystallization trials. Protein-DNA co-crystals were successfully formed. Notably, the intended packing arrangement possesses solvent pores and exposed DNA segments sufficient to capture and organize a third-party guest, like a DNA-binding protein. Future steps will involve confirming via X-ray diffraction that the obtained crystals have adopted the intended packing arrangement. Cudney B. 1999. Protein crystallization and dumb luck. Rigaku Journal. 16, 1-7. “PSI Metrics.” Home : Metrics, 28 June 2017, kb.psi-structuralgenomics.org/metrics/. Seeman NC. 1982. Nucleic acid junctions and lattices. J. Theor. Biol. 99, 237–247. Weiss MS, Palm GJ, Hilgenfeld R. 2000. Crystallization, structure solution and refinement of hen egg-white lysozyme at pH 8.0 in the presence of MPD. Acta Crystallogr., Sect. D. 56: 952-958. Zheng J., Birktoft YC, Wang T, Sha R, Constantinou PE, Ginell SL, Mao C, Seeman NC. 2009. From molecular to macroscopic via the rational design of a self-assembled 3D DNA crystal. Nature. 461, 74-77.